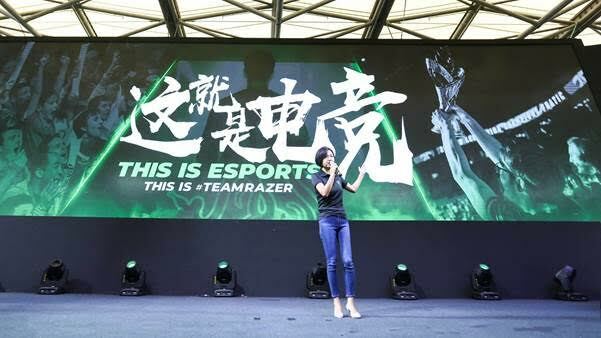 Kitty Chen, Vice President of Sales & Marketing and General Manager of China of Razer delivered a speech at ChinaJoy. (Shanghai, 3 August 2018) – Razer, the world’s leading lifestyle brand for gamers (HKEX Stock Code: 1337) today made its appearance in ChinaJoy and announced a strategic partnership with Signify (Euronext: LIGHT). Razer Chroma, together with Philips Hue smart wireless lighting system, will revolutionize the interaction between entertainment and lighting, bringing an immersive home entertainment experience to gamers across China, and offering gamers with a gaming experience of greater authenticity, magnitude and breadth. As a pioneer in immersive lighting technology, Razer Chroma has collaborated with over 100 popular game titles globally including Overwatch, Fortnite, Diablo and Crossfire to establish an all-rounded Chroma ecosystem. Through the partnership with Philips Hue, Razer Chroma has strengthened Razer’s leading gamer-focused ecosystem. Razer Chroma lighting system integrates with Philips Hue Entertainment API to synchronize the lighting ambience and gaming experience on Razer Chroma-enabled devices, including laptops, keyboards, mice and mouse pads, that are connected to Philips Hue personal wireless lighting system. The partnership enables synchronization of lighting colours and audio-visual effects of games, music and videos. Lighting effects on Razer Chroma-enabled devices can be projected to the entire space through Philips Hue lighting products to provide users a more immersive entertainment experience. Razer Chroma and Philips Hue work together to deliver a revolutionary lighting experience for gamers, from character selection to intense battling and the final winning moment, taking the immersive gaming experience to a whole new level. Kitty Chen, Vice President of Sales & Marketing and General Manager of China of Razer (right) and Vivian Xiao, Head of Integrated Communication, Signify Greater China (left) jointly announce a strategic partnership between Razer and Signify. Game developers can also use Chroma SDK to create unique gaming effects like dynamic lighting. By using the Razer Synapse 3 software and the Philips Hue module, gamers can enjoy a full-blown in-room ambience that completely transforms the way they play. The stylish and phenomenal lighting effects, together with the exceptional immersive gaming experience brought by Razer Chroma and Philips Hue have made a stunning appearance in the joint experience zone at ChinaJoy. Following the partnership, Razer Chroma and Philips Hue will join hands to participate in a series of lighting, entertainment, technology and furniture expos in China. In conjunction with offline experiences and online content marketing, the partnership strives to provide industry-leading lighting solutions to the home entertainment market in China. Founded in 2005 and dual-headquartered in San Francisco and Singapore, Razer has 14 offices worldwide and is recognized as the leading brand for gamers in the USA, Europe and China. Razer is listed on the Hong Kong Stock Exchange (Stock Code: 1337). For more information, please visit https://www.razer.com/hk-zh/. Signify (Euronext: LIGHT) is the world leader in lighting for professionals and consumers and lighting for the Internet of Things. Our Philips products, Interact connected lighting systems and data-enabled services, deliver business value and transform life in homes, buildings and public spaces. With 2017 sales of EUR 7.0 billion, we have approximately 30,000 employees and are present in over 70 countries. We unlock the extraordinary potential of light for brighter lives and a better world. On 26 May 2018, Philips Light NV officially changed their company name to Signify NV, while continuing to use Philips Lighting NV as a product brand.